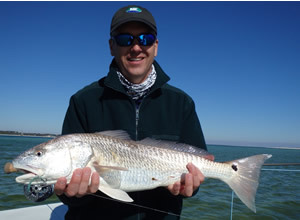 Winter 2015 arrived with clear water, plenty of redfish, and very little fishing pressure. 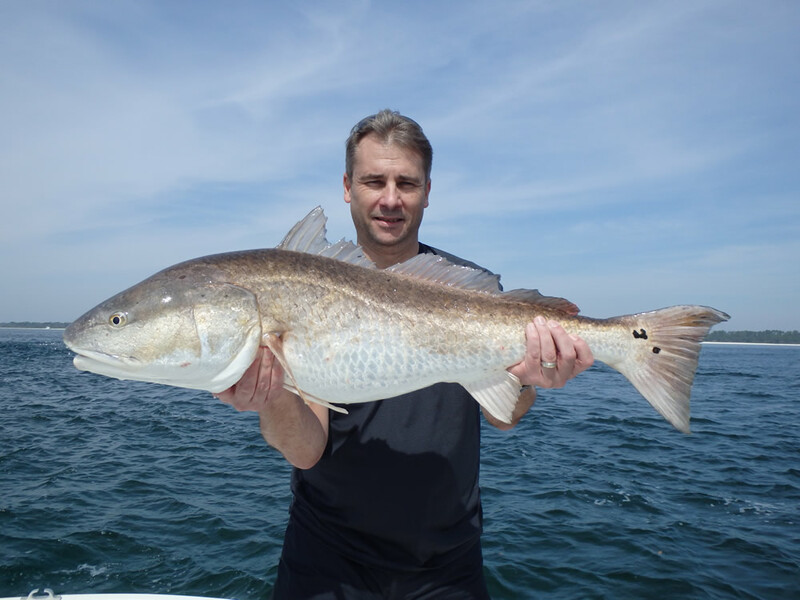 We always catch our largest redfish of the year during the winter months when the big fish feed along the sandy beaches of the Gulf of Mexico. 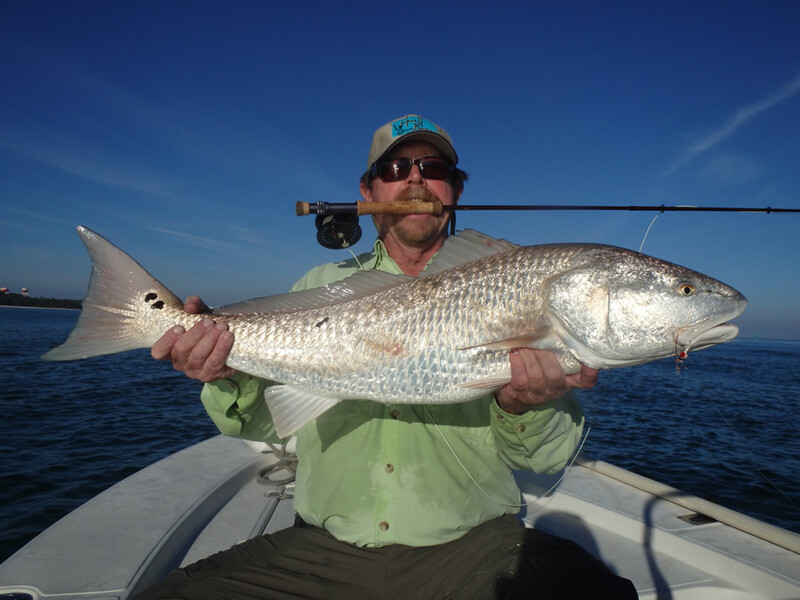 We typically pole the shoreline until we find schools of redfish and then anchor waiting for them to move into casting range. 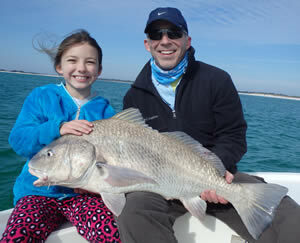 It's big-game sight-fishing at its best. High temperatures are usually in the upper-50's with lows in the high-30's, and we have to work around the cold fronts. Double-click on the thumbnails for full-screen photos. For photos from previous seasons, click on the links to these additional galleries: Fall 2014, Summer 2014, Spring 2014, Winter 2014, :Fall 2013, Summer 2013, Spring 2013, Winter 2013, Fall 2012, Spring 2012, Winter 2012, Fall 2011, Summer 2011, Spring 2011, Winter 2011, Fall 2010, Summer 2010, Spring 2010, Winter 2010, Fall 2009,Summer 2009, Spring 2009, Winter 2009, Fall 2008, Summer 2008, Spring 2008, Winter 2008, Fall 2007, Summer 2007, Spring 2007, Winter 2007, Fall 2006, Summer 2006, Spring 2006, Winter 2006, Spring 2005, Summer 2005, Fall 2005. Use the back button on your browser to return to this page. 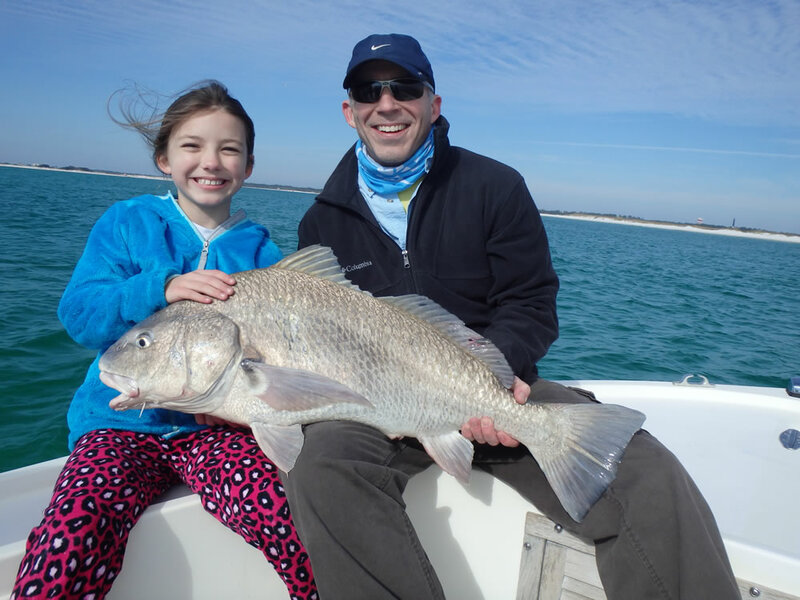 The Walters family was on the boat January 17, and young Maginnis landed this fine black drum with a little assistance from her dad Jay. The drum looks a little "freaked out" but swam away happily after the ordeal. 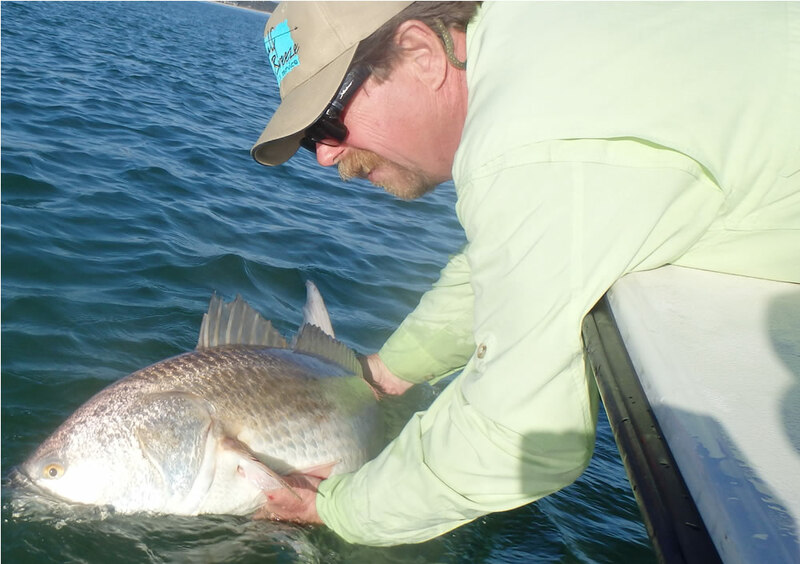 The man in the shadows is none other than our favorite Icelandic surgeon Jonas Magnusson who landed the first bull redfish on fly for 2015. 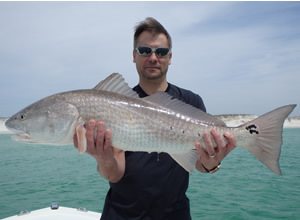 Jonas coaxed this brute to eat a tan/white "tube fly" that he'd whipped up the night before. 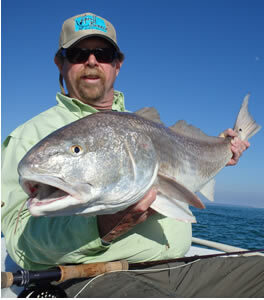 Bob Jenkins, Woody Creek, CO, was in town January 29 for another epic day of redfish sight-fishing. 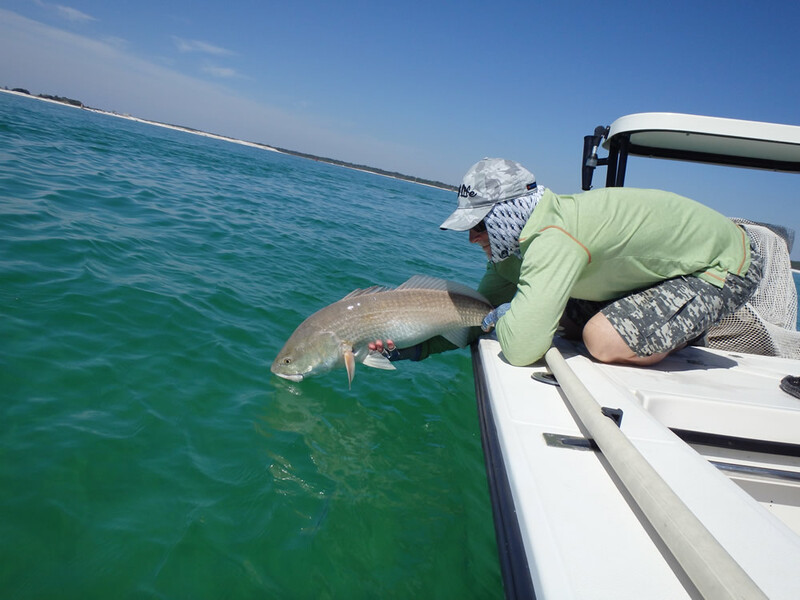 Late in the afternoon we found dozens of huge redfish feeding in shallow water along the edge of a channel inside Pensacola Pass. 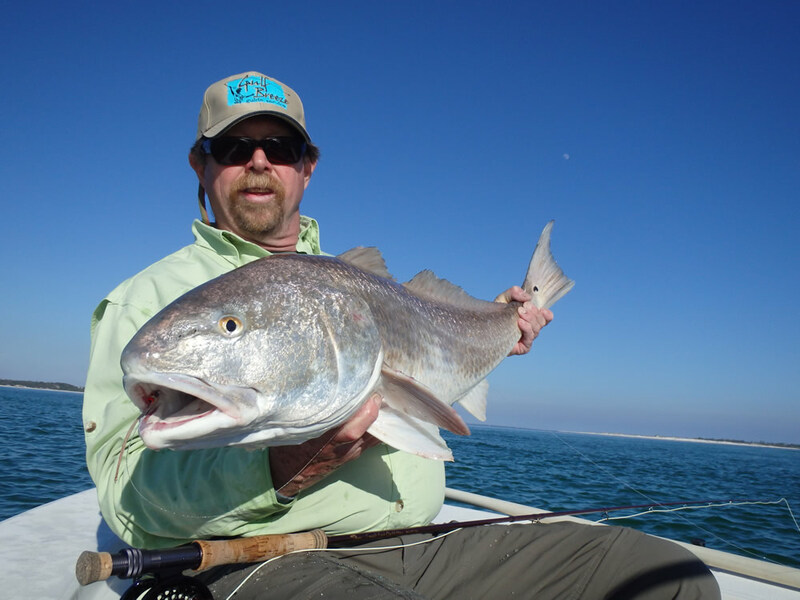 We anchored the skiff in the channel, and Jenkins cast the tan/white clouser minnow "upstream" of the fish letting the strong incoming current drift the fly into the zone. Redfish after redfish charged off the sandbar, chased down the fly, and crushed it. We had perfect conditions with clear water and the sun and wind at our backs. After an hour and a half the fish moved on, and the sun got too low for sight-fishing. 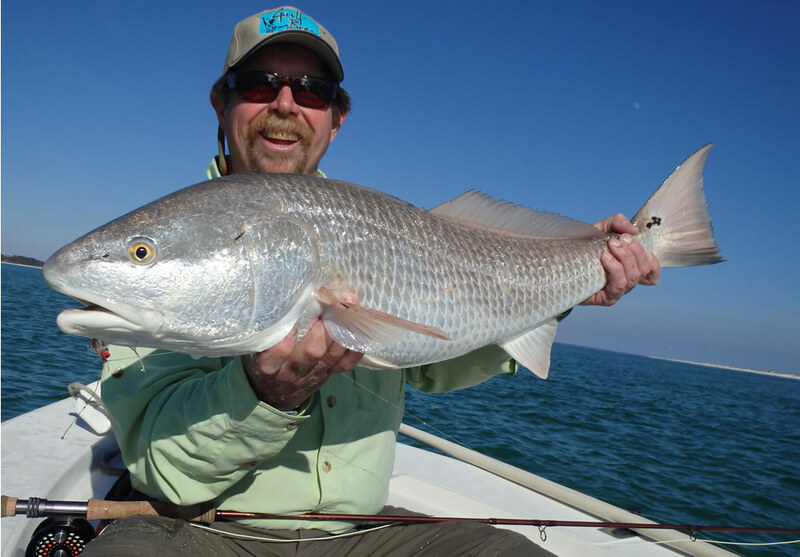 Jenkins had landed 7 fish averaging 25# with the largest "bottoming-out" the 30# Bogagrip...all on his 8wt TFO "Mangrove" rod! It was a very special day that we'll always talk about. 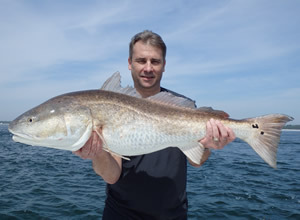 This is redfish #2. 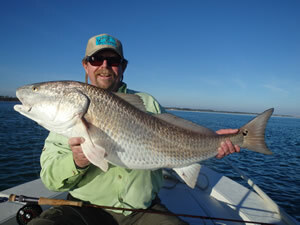 Bob Jenkins with redfish #3. ...and #5. Double click for a nice shot of the release. 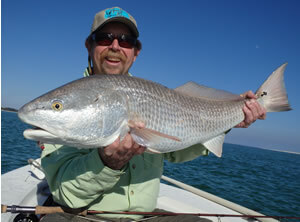 Here's a great shot of Bob Jenkins with the 7th redfish of the day weighing over 30 pounds. Man, what a day! 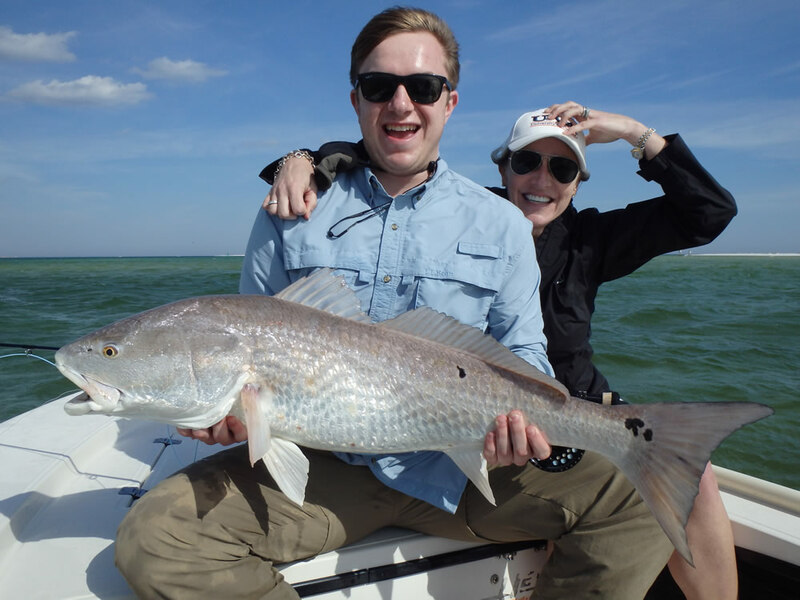 We had to work a lot harder to find the fish on February 10 but finally found a school of slot-sized and larger reds in 2' of water. 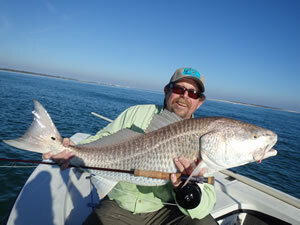 Greg Esco made a nice cast, and this fish ate the tan/white clouser. 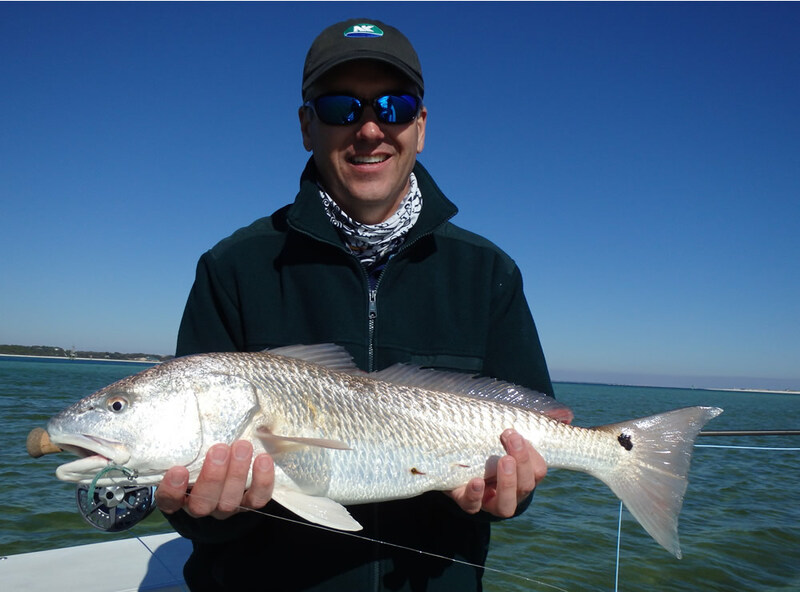 Greg's first redfish on fly which we of course released unharmed. 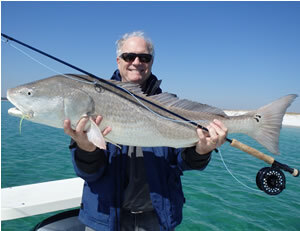 Glenn Perry was back in town on March 16, and we found schools of fish along the beach east of Pensacola Pass. 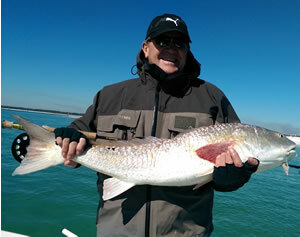 Here's Glenn with the first fish of the day which he fought for a half hour in strong current on his 8wt. Glenn with a giant...his last fish of the day. This is 16 year old Jack Repke on March 17 with his first redfish. The west wind was howling, and we anchored in the lee close to Pensacola Pass hoping a fish or two would come across the sandbar. The wind was blowing around 20mph limiting casting to the quadrant downwind and to the left...9 o'clock to 11. A large school of fish appeared well off the bow, and we watched as they slowly moved toward us. When the fish came into range Jack made a great cast, and the lead redfish jumped on his brown/white EP clouser minnow. But the hook fell out as Jack was clearing his line. Of course all the commotion moved the school out of range, and we again waited for them to settle down and move back into Jack's zone. Which they did, and he nailed this beauty. That's Jack's mom Karla in the background holding on to her camera and her hat. Great job, Jack! 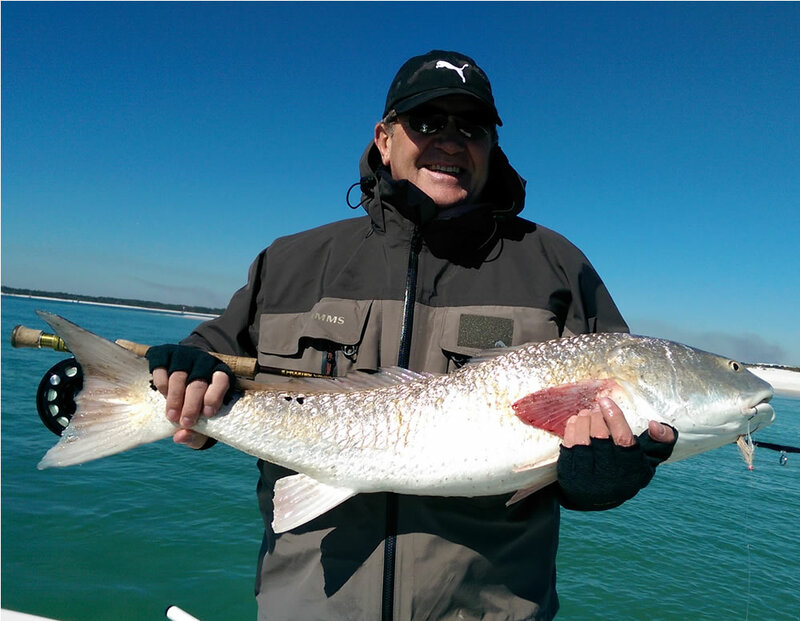 Dennis Farkas closes out the winter gallery with a couple beautiful bull redfish landed March 18 on ultra-light spinning tackle. 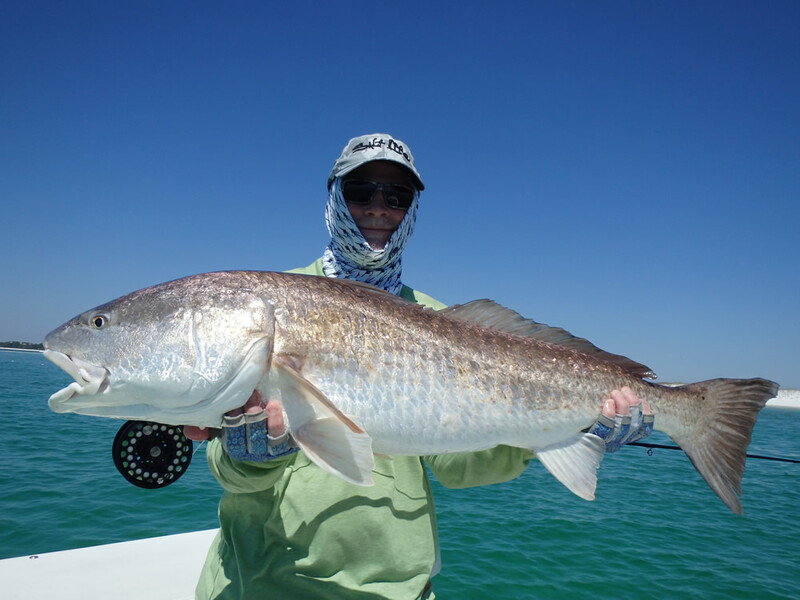 This first fish weighed around 25pounds and ate a SPRO bucktail jig. 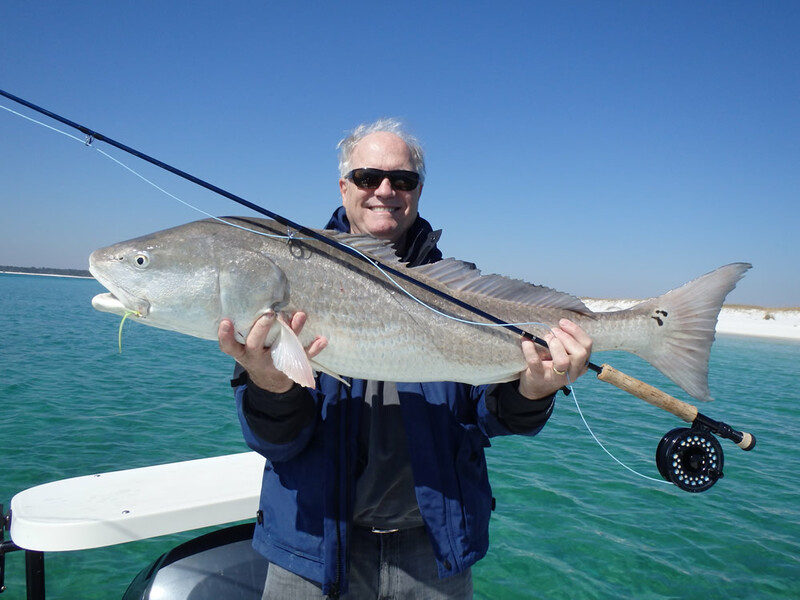 We moved farther to east where Dennis landed this fish in gin-clear water. 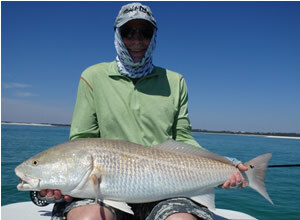 Beautiful, healthy redfish to finish off the winter gallery.